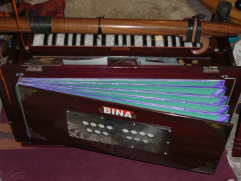 Kirtan is the sacred tradition of call-and-response chanting, brought to us from India. Kirtan is one of the principal activities of Bhakti Yoga (the path of devotion). Kirtan is open to people of all faiths and cultural backgrounds - it is in essence a meditation, repeating the many names of God, turning inward towards ourselves. We experience the energy and vibrations of communal singing, connecting to the Divine and each other, opening our hearts and quieting our minds.